Check-in is after 4:00 pm on the day indicated on your confirmation. ABSOLUTELY NO EARLY CHECK-INS. We will do our best to ensure that all properties are clean and ready for occupancy by 4pm. It may be necessary to delay occupancy until property is ready. There are no refunds for late occupancy. What is there to do if we arrive early? Please do not go to property before checking in. Parking at the property prior to check-in may delay cleaning and inspection services and prolong check-in. There are many public beach accesses where parking is allowed and you may go explore the island and various activities near the access. What do we need to do at property before departure? 1. Take out all trash and or recyclables to outside receptacles and take to street. 2. Wash all dishes and put away. 3. Remove all food from refrigerator and cabinets. 4. Remove bed linen (not mattress protectors or mattress pads or pillow protectors (and remake beds and re-bag linen if provided by service. 5.Leave all furniture in its original position. 6. Lock and secure all windows and doors. 7. Leave A/C on 76 during warm weather & 55 during cold weather. 8. Turn off all inside and outside lights. 9. Turn keys into office by 10 am. What do we do with keys if leave before office opens? There is a drop box on the front porch for keys to be returned in should your departure be before we open for office hours. When and how are security deposits returned? Security deposits are returned 30-40 days after your departure pending there is no damage to the property. The refunding deposit is credited back to the credit card that was used to make the 1st initial credit card payment, by the leaseholder that booked the reservation. Do all properties have linens? If so, what do they include? If a property includes linens, it will be stated under the property description. Linens are bed related only and will arrive from the rental company bagged. Upon departure, remove linens and place back in bag and put by door. Place comforters back on beds and remake. Bath towel sets are not included. Only weekly rentals provide linens. Rental less than a week will not include linens. However arrangements can be made with a local linen rental service. Are partial week rentals allowed? Normal office hours are 9:00-5:00, seven days a week and 9:00-6:00 Saturday’s mid- June to mid-August. We accept reservations by phone, 1-800-842-6949, online www.holdenbeachvacations.com or in person. Winter and holiday hours may vary. Are pet friendly properties available? Yes, pet friendly properties are allowed with a Pet Fee per week, only 1 small dog (45 lbs or less)per reservation is allowed. See Pet Addendum. 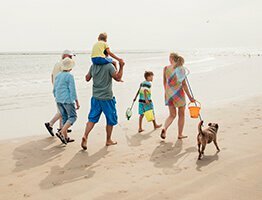 Are pets allowed on beach strand? Pets are allowed on the beach year round except from May 20 to September 10, between 5 P.M. and 9 A.M. daily. Pets must be on a leash at all times on the island. Are fishing licenses required to fish in surf or while boating? Yes. 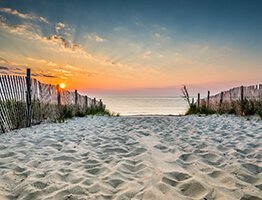 A North Carolina Coastal Recreational Fishing License is required. Licenses are available from any DMF office, WRC license agents (which includes most Wal-Mart stores), online at WRC's website, www.ncwildlife.org or by calling 888-248-6834. Are there rental equipment companies available for beach chairs, bicycles, surf boards, canoes, kayaks, towels, bed linen, baby items, etc.? Yes, there are several local companies to choose from. Beach Fun Rentals at 910-842-9600 and Boomers Rentals at 910-842-1400, Dee's by the Sea 910 842-2822, carry all items listed plus many more. What is tax rate on island? 12.75% taxes are added to expenses. Is grilling or are fires allowed on the beach? All fire related activities on the beach or on cottage decks are banned, including fireworks. Please only grill on ground level or designated areas. The Guest Protection plan can be added to your advance rent payment for 6.95% of the total trip cost. We highly recommend the purchase of this travel insurance for the financial losses you may suffer because of illness, injury or certain other unforeseen circumstances-It even includes coverage for mandatory hurricane evacuations and a number of other weather-related events. Please see a sample Description of Coverage/Policy for a complete list of covered reasons and for more information about benefits, exclusions, and limitations. For details, please see the CSA website, www.vacationrentalinsurance.com or brochure. What constitutes the need for an after hour call/emergency? The after hours emergency number can be obtained by call our office at 910-842-6949 and pressing extension #1, listen for the current emergency phone number and instructions. Air conditioning, television, internet passwords, and appliance failures are not considered emergencies. Please contact our office the following morning to have these items serviced. For all medical, fire or water emergencies, please dial 911. The non-emergency Holden Beach Police number is 910-842-6707. Reservations for a given year will be taken on a first-come, first served basis beginning January 2 of the year prior. We require a $200 tentative advance payment for each week at the time of booking, which is applied toward the new rate. All tentative reservations are subject to rate change, cottage availability, schedule changes, owner’s first right to choose weeks and changes that may occur to the cottage itself. Payment is not refundable or transferable. All cancellations are charged a cancellation fee $225. Tentative Discount Select Properties now offer a 10% discount off the published rate, by booking tentatively. Sorry no transfers. What is reservation processing fee? A processing fee will be charged for each reservation. Processing fee plus tax is due and payable with advance payment and is non-refundable. Are tents, cabanas, beach equipment allowed on beach? All unattended beach equipment must be removed from the beach by its owner or permitted user on a daily basis between the hours of 6PM and 7AM. If beach equipment is found on the beach, it will be confiscated by town officials. What is the bad weather policy? Holden Beach Vacations will NOT issue refunds of Moneys due to undesirable weather. "Closed beach”, flooded or damaged roadways or other conditions beyond our control. No refunds will be issued for a mandatory town ordered hurricane evacuation. Please see Travel Insurance for further details. What does cottage cleaning include? The cleaning of the cottage is handled by a professional company upon your departure. Each guest is responsible for the required departure items listed under ‘check out’. What are the cancellation and transfer policies? 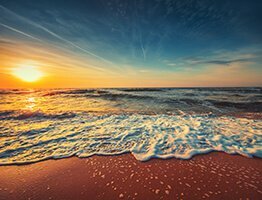 In the event there is a cancellation or a transfer of a confirmed rental for any reason, Holden Beach Vacations must be notified in writing, email or fax. We will make every reasonable effort to re-rent the property. If the property is re-rented for the original lease amount, tenant will receive a refund of the payment made less a cancellation of $225.00 after receipt of entire balance due on new reservations, on same property, same rental period, otherwise no refund will be issued. 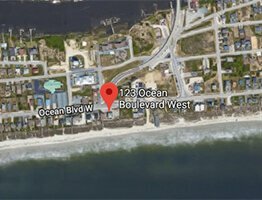 Holden Beach Vacations reserves the right to re-rent the property as a reduced rate on behalf of the property owner and to cancel overdue payment reservations without notification. Lost and Found-how is it handled? If personal items are left in the cottage and are found by housekeeping, they are turned into the realty office. They will be shipped by via Shipping Station in Shallotte, NC for a fee determined by the company.